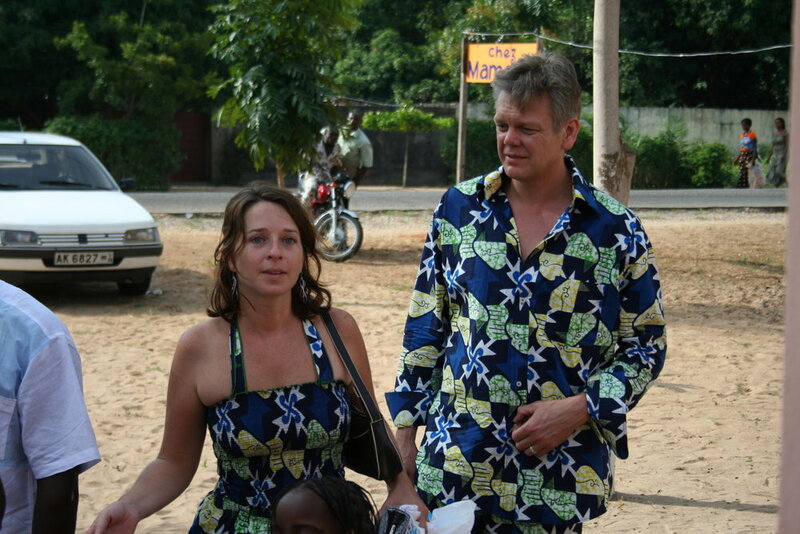 Eight years ago today, my husband and I got married in Ouidah, Benin. At the time I was living in Cotonou as a Fulbrighter and Stu was living in the U.S. We had been doing the long-distance thing for about six months and really wanted to get married before I made my way back to the States. Here is an update that I wrote back then to tell family and friends about our wedding day. I hope you enjoy it (spoiler alert: you'll find that many members of the Three Sisters family were there, long before TS officially existed). It’s been far too long since I’ve taken the time to write an update, and it’s about time that I get you guys caught up on what’s been happening in these parts. Once again I fear that this may be a long one, so grab a cup of coffee, a cold beer, or a glass of wine (depending on what time of day or what kind of mood you are in) and let’s begin. So much has happened since the last time I wrote an update that it’s hard to figure out what will make the cut. If I write everything you’ll still be reading this by the time I get back. On the day of our wedding (July 3) we had rented a bus that would seat 25 people because our ceremony was to be held in the city of Ouidah, about 20 miles west of Cotonou. We both wore matching outfits made with the cloth that Annie had chosen for her father’s funeral, a vibrant blue pattern. I must admit we looked pretty good! Our driver, however, was unimpressed. As a matter of fact, he was downright ornery. At about 10:30am we loaded up the bus with items we needed for the wedding and started on our way. We stopped at a little kiosk down the road to pick up our flowers (gorgeous) and then tried to get the driver to stop at the supermarket to greet the guard who had been eagerly awaiting Stu’s visit. Unfortunately, the driver would only slow down, so the guard had to run alongside the car to shake Stu’s hand out the window as we rolled away. Gorgeous flowers for sale in Haie Vive, Cotonou. As the wind (accompanied at times by noxious fumes and dust) blew through the bus we drove east to pick up Maman Eli and her family. It was beautiful and sunny that day, but it had rained heavily two days before. As a result, Maman Eli’s neighborhood was completely waterlogged. At one point we almost got stuck in a massive puddle, had to back up and try another route with a 10 year old boy as our guide. We determined that it would be impossible to get to their house with the bus, so we called up Maman Eli and told them to come on foot and meet us at a Church where they had put bricks and stones through the water for people to step on and cross. Maman Eli, her younger sister, and their kids walked up and were quite a beautiful sight. Eli and Manu were dressed in matching cloth, everyone had their hair done, and Eli was wearing makeup (including eyebrows drawn in with pencil). Très jolie! Manu looking fine in his pagne (cloth). From there we headed over to Annie and Bienvenu’s place to pick them up. Once again, we couldn’t get all the way through because of the water in the road, but Bienvenu had come on his motorcycle to greet us. Stu and I walked to the house, left everyone in the bus and said we’d be right back. For some reason we were really under the impression that everyone would be ready and we could continue on our way in a timely fashion. Alas, that was not the case! When we walked in the courtyard we were greeted by lots of people in the household with calls of “felicitations!” (congratulations) and “ekaabo!” (welcome). Stu had been there in February too, so everyone was excited to see him again. We were ushered into the living room and they immediately brought out some beers for us to drink. Extended family members started coming in, and as I was smiling and nodding and enjoying my beer I was also doing some quick calculations in my head and beginning to panic. This was not to be our last stop on the road to Ouidah, and there was no way we could fit everyone in the bus. Annie emerged and she looked just amazing. She and the kids had spent the day with me on Thursday (the day before Stu was to arrive) and we had discussed outfits, hairstyles, and the ceremony. She had put a lot of thought into her outfit and it showed. We had asked her to play an important role in our wedding, a combination ring-bearer/maid of honor/emcee. She took that role seriously and wanted to match the wedding party in her attire. Anie and Bienvenu at the wedding. Anyway, back to the story. We were all having a good time catching up (meanwhile I’m wondering how everyone is doing back in the bus, remember them?) and Bienvenu told me that he was looking for other options for transport since it was obvious we would not all fit. Minutes stretched into close to an hour, or even more than an hour. Stu and I seemed to be the only ones concerned about those who were waiting in the bus. Eventually Bienvenu found another bus and we all hit the road. As we got back to the bus Maman Eli and family were all still there, a bit bored, but understanding. Thankfully a frozen yogurt guy was walking by with his cart and we bought yogurts for everyone who had been stuck in the bus. One by one as each person finished their yogurt they threw the plastic container out of the window, including Eli who expertly reached over Stu and lobbed her plastic sachet toward the innocent bystanders on the curb without a second glance. As our caravan took off, I got a call from Bienvenu. There was some kind of wahala with the bus, I asked our driver to stop but he said no. According to Stu, I began waving my hands around and telling him to stop. I put the phone to the driver, he talked to Bienvenu and then we started going again. Apparently what had happened is that there were so many people in the other bus that Bienvenu was left behind. His neighbor ended up getting out and catching a ride with her husband who had a car (why was she not in that car in the first place? Good question, who knows!). This neighbor is a very nice woman, but is not the smallest in stature. In fact, she had been used as a stand-in for Stu when we had the tailor come over to have his outfit made. No lie. Kastro! She made it after all. But will we? Keep reading to find out. You should have seen the look on the driver’s face when I told him we needed to stop by our apartment again. “Cadjehoun, encore?! ?” Waiting at our apt in Cadjehoun was the band who would play at the wedding, Keface and his daughter, and Kastro, who managed to catch a zem to join the bus. Ok, what I should say is that we thought everyone would already be there since we were really late already. But the band members were not all there. They had dropped off their motorbikes someplace and were walking back. Some of their instruments were there, however. We realized it would get even tighter in the two buses. The lead singer of the band belting it out, while Bienvenu (left), Keface, and his daughter look on. Enfin, all of the band members arrived and we set out again. Just a couple more stops to go! But at least from this point on it was direct to Ouidah and no diversions. Katrine’s daughter Anita was to be waiting for us on the side of the road by a supermarket. Unfortunately, she had been there for a while and was then called by her father and had to go someplace in 45 minutes so she and her cousin went back home. I got a call from one of the students that I am working with, she and a friend were waiting by a roundabout on the way. I told the driver we needed to stop at the Carrafour Godomey. He said fine. And then proceeded to speed right through it. 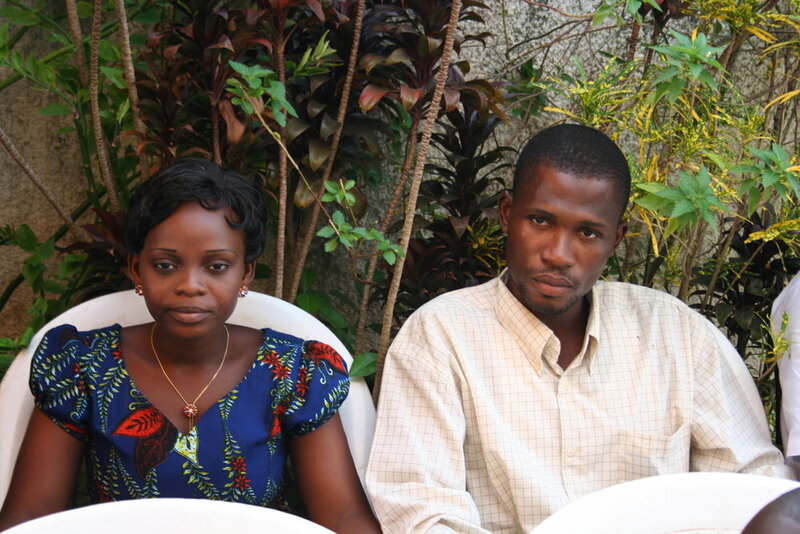 Despite the intentions of the driver, Sandrine and her friend made it to the wedding. He turned off the car with an angry flourish and we waited. Sandrine and her friend arrived, greeted everyone in the increasingly sardinish van, and we took off again. Well, we tried to take off again. The driver turned the key and nothing. Absolutely nothing. He turned to me and glared, then tried again. Not a word, and he pulled some wires out, tried to work some magic. Nothing. He got out, slammed the door, and walked away. I turned back to everyone and smiled, squeezing Stu’s hand. Wahala ni! At this point it was around 2:50 or so. The wedding was to start in Ouidah at 3pm. Pas possible. I sent a message to our hosts telling them to give everyone who was already there a drink and some food to pacify them while we tried to figure out the bus situation. And here’s the real kicker – the second bus, filled with Bienvenu and his family, sped by us merrily on their way to Ouidah. Vraiment! It was at this point that the band told us we needed to pick up their manager a few kilometers down the road. Their manager?!? Stu and I were really beginning to wonder if we would ever make it there (and yet were not surprised that we were late to our own wedding…) when the driver walked up with a young mechanic. They pulled the driver seat up and back, and began to work some magic with the wires down below. It definitely smelled like something was burning, or had been recently. The mechanic used his teeth to pull off some of the plastic covering on wires, felt them to see if they were active, and in a matter of less than 5 minutes had the car running again. African mechanics are truly miracle workers, as Stu has seen on several occasions (funny enough, the last time he witnessed something like this was in Togo when he was carrying the engagement ring in his bag and our taxi broke down. Nothing like a little car trouble to add to the excitement of a big day!). We set out once again, and I instructed the band members to tell the driver that he had to stop again. I wasn’t going to be the culprit this time! My phone rang seconds later and it was another student telling me he was in Ouidah but he couldn’t find the location. Completely lost. I kept telling him the directions, but the noise level in that bus was incredible. “Je ne comprends pas!! !” I shouted in frustration. Which didn’t seem to make any difference to him. Guests having a good time while they wait for the bride and groom to arrive. C'est normale. We barely rolled to a stop to pick up the last passenger, everyone squished in for the last stretch to Ouidah. Eli, Stu, and I fell asleep in a happy bundle in the front seat and chose to ignore the back of the van for a little while. Half an hour later we reached “Chez Maman V” the home of our friends and hosts, Willy and Evelyne. She is French and he is Beninese, and they just moved from Cotonou to Ouidah to open a buvette, or small outdoor bar. I’d been there the Saturday before for the inauguration of the bar, and they were very excited to host our wedding. As we pulled up we saw friends out at tables enjoying a drink and awaiting our arrival. “Vive Les Mariés” (Long live the married couple) read a colorful sign on the wall. Evelyne and a friend at Chez Maman V a week before our wedding. Stu and I, with Eli in tow, made our way across to greet everyone. A tent had been set up in the courtyard with chairs lined up in rows for our guests. We quickly made our way inside to the room that Evelyne had set up for us to get ready in. Everyone who had been in the van made their way to the chairs to join those who had already been waiting around an hour and a half for the ceremony to begin. We, however, felt that we deserved a little down time before the big event and so we took a shower to wipe off the grime of the road and refresh ourselves. Our guests waited in the chairs outside. They had no choice. After a brief, but very intense, period of panic during which I thought I had forgotten the jewelry that Annie made for me, we emerged into the foyer, ready to go. Annie and Eli were brought inside with their flowers and I explained to Annie once again what she needed to do. Bienvenu was our videographer – he and Annie disagreed about what her role was. I explained it once more and we were on our way. Well, almost on our way. Just then Annie’s shoe fell apart. It was a pretty shoe, too. We called out to her friend who was one of our guests. She had super glue in her purse. Or she thought she did. Turns out it was in her other purse, in the van. We called out to Annie’s domestic, who had to run to the van, find the purse, bring it to us, and then go back to watch Heather again. Meanwhile, Willy is running back and forth trying to find one of Evelyne’s shoes that might fit Annie. He told her she had huge feet, and not to mess up his wife’s shoes (I think it was supposed to be a joke, although I’m not quite sure). Throughout all of this little Eli is just standing there with her flowers, a bouquet that is about 3 times as big as her, with her eyes wide open in fear, wondering when this personal nightmare is going to be over. Thankfully, it would be soon. Eli, the reluctant flower girl, wondering when this living nightmare will end. We waited for the superglue to dry and finally we were ready. Bienvenu and Annie’s friend went back outside, everyone quieted down, and Annie emerged with her beautiful bouquet and a gorgeous smile. “Soyez le bienvenu!” Welcome everyone! Anie welcoming everyone to the wedding! Annie was followed by Eli, who was directed by Bienvenu to stand still for some photos, and then she quickly made her way to her seat in the front row. It was then time for Stu and I to emerge. We held hands, smiled at one another, and walked out the front door to the sound of wild applause and cheering. Stu looked absolutely amazing in his white bazzin (a type of cloth worn on special occasions) with black embroidery (done by the Senegalese who are known for being great embroiderers) very regal. It was a wonderful feeling being next to him and seeing the joy on our friends’ faces! We stood there, basking in the moment, and then sat down in front of the desk. The man who was to marry us came up a minute later and sat down very solemnly. He waited for the crowd to shut up. They did not shut up. He waited a bit more, our friends had gathered around to take photos of us close up. They waited for him to start. He waited for them to go away. Eventually he indicated that he was not going to start anything with such a production beside him, and they all reluctantly headed back to their seats. 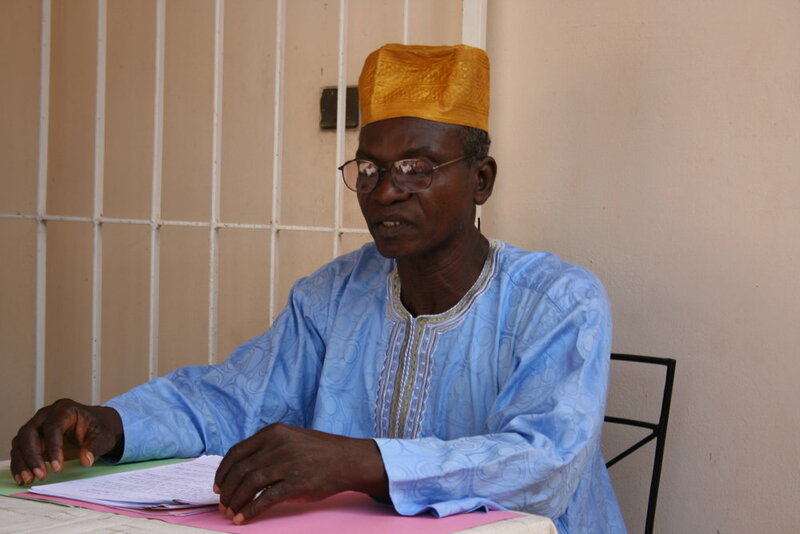 Our wedding officiant, an elder from Ouidah. The whole ceremony was done in French and English, and he began by asking Stu and I to explain what we understood family and marriage to mean. He and I had discussed this the week before, so we were not just put on the spot without prior knowledge. Stu gave a very thoughtful response, and the monsieur became very impatient to know what he was saying so he demanded a translation halfway through. Stu was never able to finish his comments, and mine were glossed over with “Marcy and I discussed this last week so I know she is of the same understanding as Stu.” I, however, appreciated the sincerity and care that Stu took with his words and squeezed his hand to let him know I felt the same. He then went on to discuss several items from the civil code of Benin regarding family, some of which were so important that he looked at the audience and said, “Pay attention, this applies to all of you.” Pretty funny. I think Stu and I were both afraid that he’d read the civil code in its entirety. Fairly soon after, but not soon enough, he asked for the rings. Annie came up and gave them to us, we exchanged rings, kissed and were pronounced Mr and Mrs O’Neil. We were immediately pelted with rice! As a surprise, Evelyne had made little packets of rice and instructed our guests to throw it at us when we were pronounced husband and wife. Based on the velocity of the rice, I’m pretty sure they viewed it as ammunition and payback for being stuck in the van for several hours. The rest of the evening was great; we enjoyed live music from the band, nice food and drink, and the company of our friends. It was the most wonderful day of our lives. 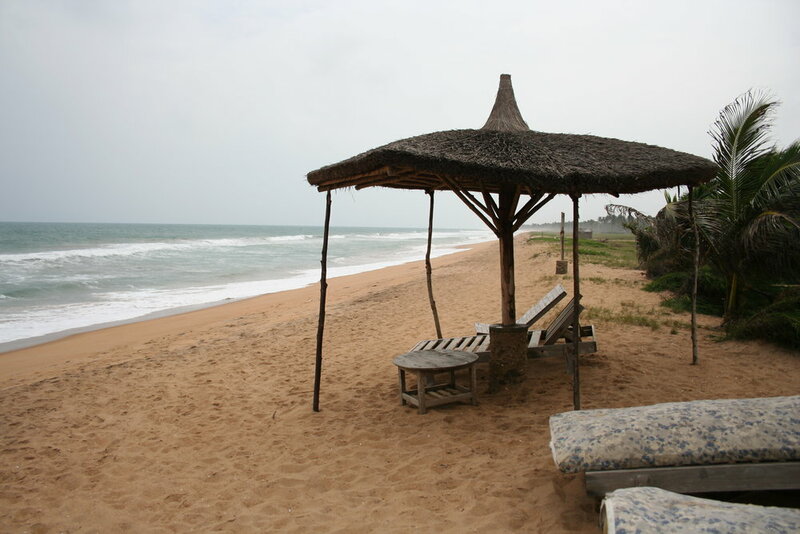 Especially the moment when we bid adieu to all of our friends who were going to take the buses back to Cotonou, and we stuck around to begin our honeymoon at a little auberge on the beach. Group shot - say cheese! Although that, too, was an adventure in itself. For you see, when I told Willy and Evelyne that we had reservations at Au Jardin Helvetia they were under the impression that I just got the name wrong and we were really staying at Au Jardin Bresilia. I had told them we needed a taxi, and as we were preparing to leave they came joyously into the room and said they were going to take us themselves. It turns out that Willy’s sister overheard him calling for a taxi and said they could take her car. I said it was too far and we could get a taxi. Evelyne said it would be romantic, taking the newlyweds to their honeymoon hotel. I bet she’s still regretting that offer. And then we started the journey. Keep in mind that night had fallen, I had never been to said hotel before, and I was just about out of credit on my phone. Add that to the fact that the road makes bumpy cake look smooth and, you guessed it, wahala ni. The hotel that they thought we were staying at was just outside of town. Very close to their house. But no matter how many times Evelyne said “Au Jardin Bresilia” and I corrected her by saying, “Non, Au Jardin Helvetia” we still kept driving on. I tried to call the hotel to get directions, but the number that I had wasn’t working. There is no “411” in Benin, so calling information was not an option. As we drove on slowly, tumbleweed began to blow by the car, and Willy’s conversation turned to bandits. “Bandits love this road. They’ll stop you, make you get out, take the car and your money, and leave you by the side of the road.” Wonderful. Just what we needed to end the lovely day! Once again our thoughts turned to the fact that we may not reach our destination. Willy told me to call the hotel. I told him I tried and it didn’t work. He told me to try again, and added, “this is far!” He continued driving, turning off the lights every once in a while (whether this was to determine distance from other lights or to scare Evelyne, I’m not quite sure – although I think it was a little of both). “We’re driving all the way to Cotonou!” said Willy. 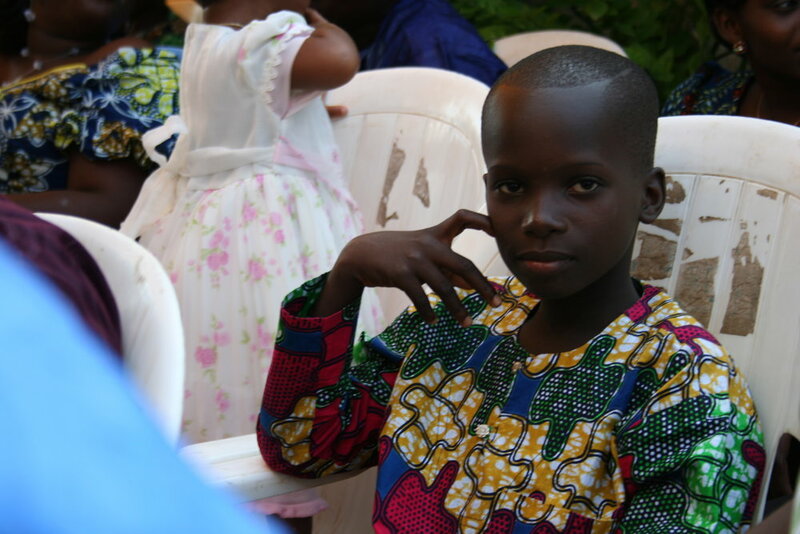 “I know.” I thought… “I tried to tell you it was between Cotonou and Ouidah..” I desperately sent out a text message to Emily, hoping she was home and could check the internet for the phone number. Turns out she was still on the road too. Next in line was Iffy. I sent her a message and within 2 minutes got a message back with several numbers to try. Enfin! One of the numbers worked and I passed the phone to Willy. As he attempted to navigate the enormous potholes, look out for bandits, and talk to the woman on the phone, Evelyne kept shouting something about Au Jardin Bresilia! Stu and I looked at each other, squeezed one another’s hands, and contemplated jumping out of the car and going on foot instead. Beautiful road in the day. At night, a little dark and creepy. Especially with talk of bandits. Thankfully by that point we were actually very close to the hotel. We turned in to the grounds and saw a beautifully manicured lawn that Willy tried to drive over until he was stopped by both Evelyne and Morenike, the proprietor. A smile returned to both of our faces when Morenike came up to the car and said, Madame O’Neil? We took our stuff from the trunk, Willy and Evelyne high-tailed it out of there, and we were led to our bungalow with the offer of some fresh fish brochettes, French fries, and cold beers. They were so welcoming that they also stocked our fridge with cold beers and told us they would bring our dinner to the terrace and we wouldn’t even have to leave the room. It’s like they already knew us. As we tore the gold foil caps off of our Castel beers, Stu and I looked at one another and smiled with the realization that we wouldn’t have to drive anywhere for at least two days. Besides that, we were finally married!!! Ten and a half years from the day that we first met, and it was about time! Don’t worry, that’s all this update is going to consist of. And just think, that is just one day (albeit one fantastic, extraordinary day)! Life here is never boring, although I miss everyone at home greatly. And I even miss the Michigan roads! Enjoy the day and know that I am thinking of all of you constantly. The joy of finally making it to our own wedding! Lauren, Iffy, and Abdou helped us celebrate. Maman Eli, her sister, and the kids helped us celebrate this amazing day.